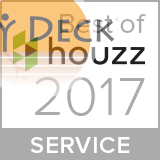 MY DECK has earned national recognition for 2011 Best Alternative Deck under 500 square feet designed and built for the Conover-Gorny family of Skillman, New Jersey. The award is sponsored by NADRA, North American Deck and Railing Association and the winners are chosen from entries all over the country. The award ceremony took place in October 2011 and was held at The Museum of Science and Industry in Chicago. MY DECK was also honored with a second award in the same category from the state of New Jersey for its composite deck designed for the Macklin family of Skillman. The award was given at the December 14th’s NADRA meeting in Woodbridge.